Atomic Scala introduces the foundations of the Scala programming language in very small steps (which we call atoms). The book is designed to simplify learning the language for both beginners and experienced programmers. 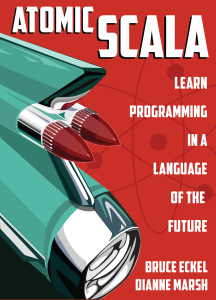 Atomic Scala by Bruce Eckel and Dianne Marsh is now available as a print book (the eBook will appear later, once we sort out all the formatting issues, which are more involved because of fonts and code listings). You can download the first hundred pages of the book on this Download page. LINK to Web site (for e-Book and other info). Model Driven Engineering and Ontology Development.